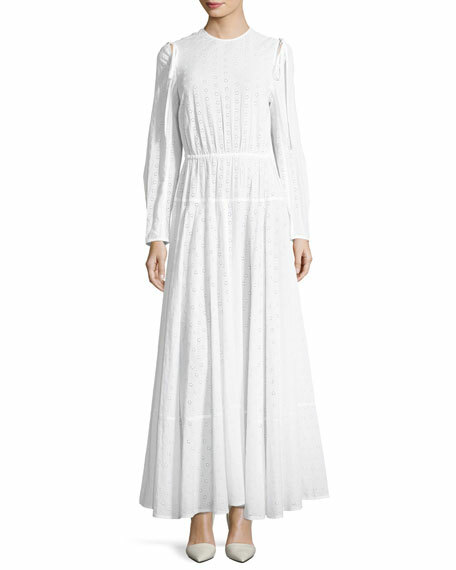 CALVIN KLEIN 205W39NYC broderie anglaise dress. Round neckline with ties at back. Fame and Partners "The Peridot" cocktail dress with tie-waist detail. Crew neckline buttons at back; open back. Long sleeves; split cuffs. Shirred waist ties at back. Sheath silhouette. Midi length. Vented back. Straight hem. Polyester self. Heavy georgette lining. Dry clean. Imported. Norma Kamali sheer, ruffled gown. Please note: bodice is completely sheer, and slip shown is not included. Round neckline. Sleeveless. Norma Kamali sheer, ruffled gown. Please note: bodice is completely sheer, and slip shown is not included. Round neckline. Sleeveless. A-line silhouette. Tiered ruffle skirt. Slipover style. Floor length. Nylon self. Machine wash. Imported. Model's measurements: Height 5'10"/177cm, bust 33"/84cm, waist 25.6"/65.2cm, hips 35.8"/91cm, dress size US 2-4/FR 34-36. Rebecca Taylor dress in polka dots. Ruffled, round neckline; quarter button front. Long sleeves; smocked cuffs. Self-tie sash at waist.